BoingBoing Marjorie M. Liu and Stephanie Chong interview each other. Fantasy Cafe interviews Courtney Schafer. The Functional Nerds interviews Colin F. Barnes (podcast). Believer (Emma Brockes) interviews Maurice Sendak. ComicBookMovie.com interviews George R.R. Martin (video). The Roundtable Podcast interviews Lou Anders (podcast). Apex Magazine (Maggie Slater) interviews Alex Bledsoe. I Should Be Writing interviews Pip Ballantine (podcast). SFWA (Aliette de Bodard) on Common Myths About Science. Strange Chemistry on Top Ten Tropes in YA – featuring A E Rought. 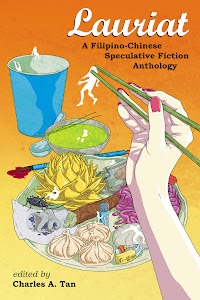 Strange Horizons (Mark Plummer) on Paraphernalia: The Time Traveller. Paul McAuley on Just Like Science Fiction. Weird Fiction Review (John Clute) on The Darkening Garden: Vastation. John Scalzi's The Big Idea: Ryk E. Spoor. Apex Magazine (Steven H Silver) on Behind the Convention Curtain: Programming. Flavorwire (Emily Temple) on 10 Great Authors We Should All Stop Pigeonholing. Book View Cafe (Deborah J. Ross) on The “S” Word. Juliette Wade on "Eagerness to please," and the weakness of database marketing for directing the future of SF/F. Mary Robinette Kowal (Lee Moyer) talks about Literary Pinups 2013. Missions Unknown (Scott A. Cupp) on Forgotten Film: The Gorgon (1964). Sci-Fi Fan Letter reviews Ella Enchanted. Cover Art Launch: Gary Gibson's Shoal Trilogy Reissued. Spacequest: Art by Gray Morrow, 1976. Spaceship concept art by Francis Tsai. 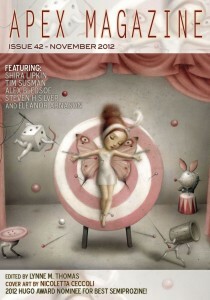 Apex Magazine Issue 42 released. Auction for Hurricane Sandy relief — Without a Summer manuscript.